We’ve been having a bit of healthy snack time fatigue around our house, so we decided to whip up a new snack that would satisfy our need to crunch, is healthy, and is affordable. We’ve tried store-bought brands of kale chips before, some of which are truly delicious, but they are often too expensive to be an everyday purchase ($7.00 for a bag of dried kale - no thanks!). 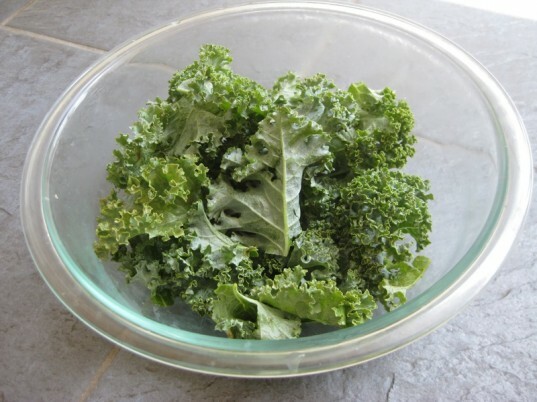 Kale is a Vitamin A and C powerhouse, and it is relatively easy to find at most markets. 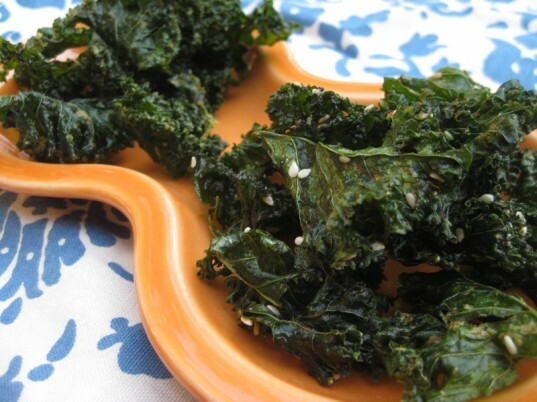 Here are my family’s recipes for the more traditional, "cheesy" kale chips as well as an Asian-inspired version. Wash your kale well, then break into pieces (I like to make them slightly larger than bite-sized so that they don’t crumble when being stored). 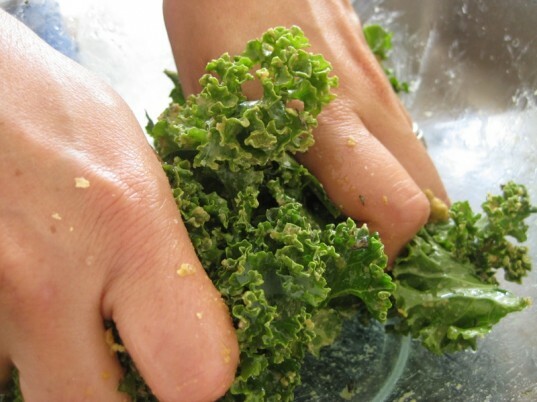 In a large bowl mix kale pieces, olive oil, nutritional yeast, apple cider vinegar and herbs. Massage everything together for several minutes (this is a great messy job for kids to help with!). Make sure all of the pieces are coated well. 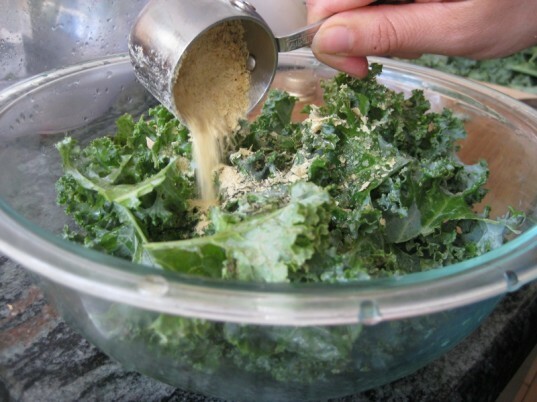 Add an additional teaspoon or two of olive oil if the kale seems especially dry (since a “bunch” can vary greatly in size). 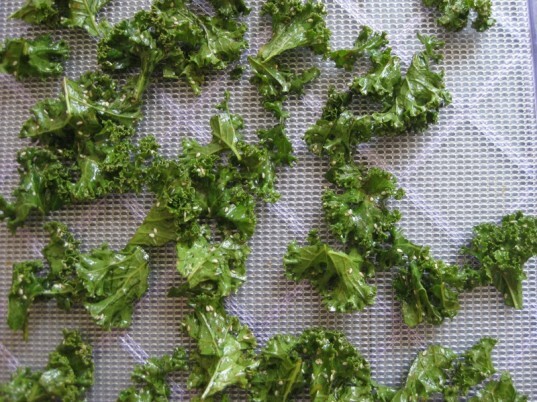 Spread kale pieces onto dehydrator trays. You will need about two trays per bunch of kale. Dehydrate at 115 degrees for about 4-5 hours, until crisp and dry. Cool and store in an airtight container. Try to stop yourself from eating all of them in one sitting! Follow the same directions as for traditional kale substituting the soy sauce, sesame oil, ginger, and sesame seeds for the traditional version’s ingredients. Enjoy! 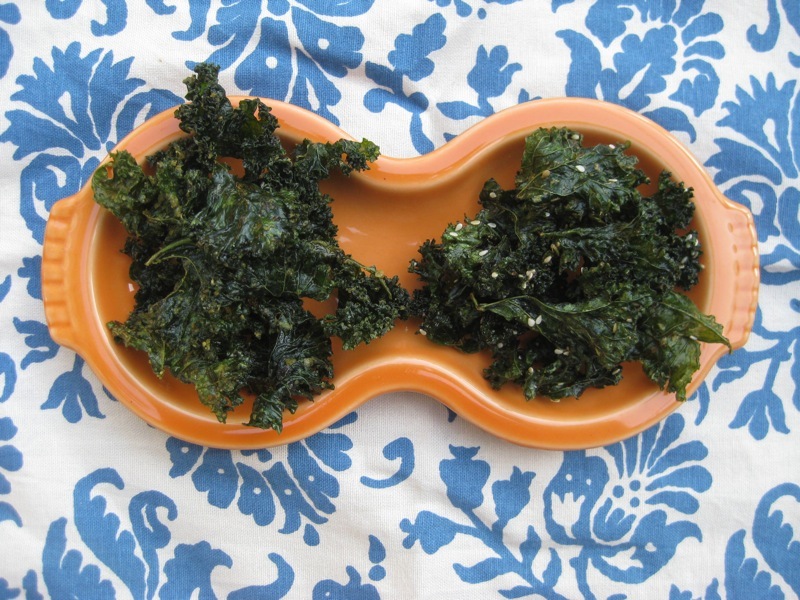 Note: Kale chips are mainstays in many raw food diets, and we use a dehydrator to keep drying temps low to maintain all the food’s nutrients. 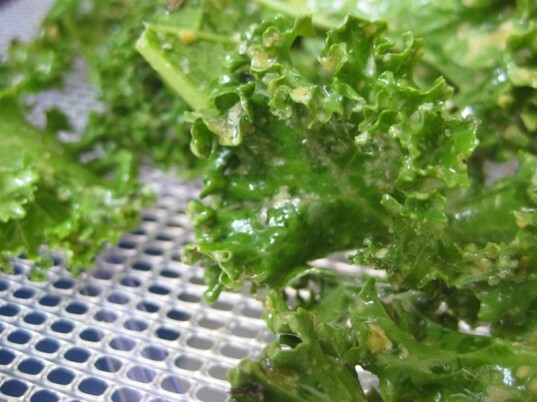 However, if you don’t have a dehydrator, put your oven on the lowest temperature (usually around 200 degrees), spread the kale chips on a baking sheet, and cook with the oven door cracked. You will need to check the recipe every 15 minutes or so, since the temperature will be harder to maintain than in a dehydrator. This recipe calls for one bunch of kale but it doubles and triples well so feel free to buy (or grow) as much kale as you like-the chips will get eaten up before you know it! And it’s a great recipe to get kids involved. Follow the same directions as for traditional kale substituting the soy sauce, sesame oil, ginger, and sesame seeds for the traditional version's ingredients. Enjoy!